JUMLA, June 20: Over 40 people including doctors, nurses and students were injured on Thursday when security personnel entered the premises of Jumla-based Karnali Academy of Health Sciences (KAHS), used batons to disperse the opposing crowds, and forcefully took Dr Govinda KC out of the hospital for airlifting to Kathmandu. The team assigned to take Dr KC away had arrived in the afternoon with a Nepal Army helicopter . A large number of Dr KC's supporters including students, locals, health personnel and the mothers group had already gathered outside the hospital. 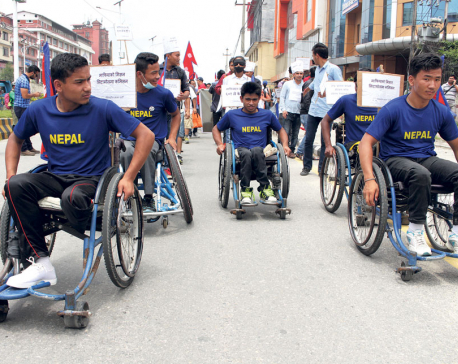 They prevented the team from meeting Dr KC as he had expressed a wish to continue his fast-unto-death at KAHS until his demands were fulfilled. Tension flared after security personnel intervened . They charged with batons at the heads of students who were at the gate to prevent the government team from entering. Blood spilled from the merciless beatings. Police then forced their way into the building, continued their merciless baton charge on KC's supporters and vandalized the hospital also. The tussles between police and protesters led to broken windows, tables and beds, causing a loss to the hospital of millions of rupees. Police constable Kamal Acharya was also injured, in the chest. While claims have been made that it was a gunshot wound, this is yet to be verified. Acharya underwent surgery at KAHS. Senior orthopedic surgeon Dr KC has been staging a fast-unto-death at KAHS, demanding various reforms in medical education. His hunger strike marked the 20th day on Thursday, which also saw steep deterioration in his condition. Forced to act by the critical condition of the fasting doctor, the government had decided to bring him to Kathmandu for treatment, going against his will. KC initially protested, calling it an 'abduction' and gross violation of his rights. He claimed that the government was attempting to foil his campaign for medical education reform. However, after seeing the clashes between his supporters and the security personnel coming for him, KC agreed to go to Kathmandu with the government team so as to prevent further violence and vandalization of the hospital. He would have no choice but to oblige as the team was instructed to bring him back to the capital at any cost. “Stop the thuggery and stop vandalizing the hospital. I will go to Kathmandu rather than spark such violence,” KC told Karnali Province Chief Minister Mahendra Bahadur Shahi. Shahi had also reached KAHS to help the team taking the doctor away. 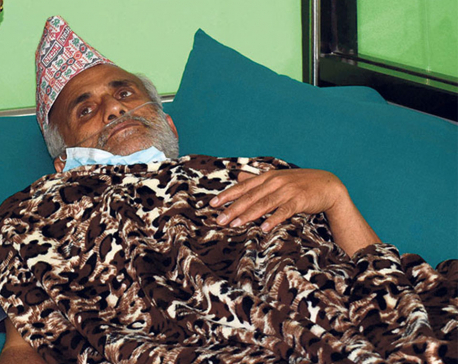 At around 8 am, Dr KC was already aware of the government's preparations to take him to Kathmandu by force. He released an audio message, protesting the government's decision. Around half-an-hour later, an army helicopter arrived. But supporters of Dr KC flooded the hospital building and premises. Chief Minister Shahi and Law Minister Naresh Bhandari tried to reach KC, but to no avail. Shahi and Bhandari then left the hospital and went to the army barracks where the helicopter was on standby. 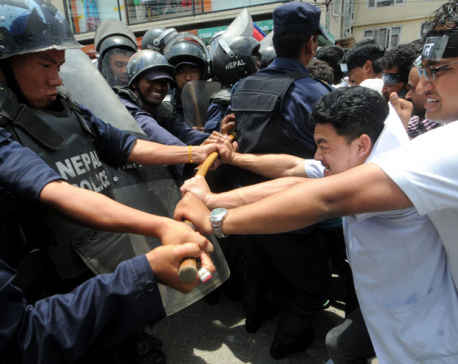 They instructed security personnel to bring Dr KC out at any cost. As per the instructions, police used excessive force to break through the gate and enter the building. They charged into students, doctors and nurses with their batons, leaving many of Dr KC's supporters bleeding from the head. Jumla Chief District Officer Bishnu Paudel instructed police to shoot anyone opposing the police action. Police used a loudspeaker to warn that they would open fire if the protestors intervened. However, no shots were fired. As the violence continued, Dr KC expressed a readiness to go to Kathmandu so as to calm the situation. But he pledged to continue his hunger strike in the capital. The attempt to evict Dr KC started at 9:30 am and succeeded only at 4 pm.